For many years Southeast Asia has been considered `the cradle of influenza’, an area of the world where both human and animal influenza viruses circulate more-or-less year round, and where humans and farm animals often live in close proximity with one another. In March of 2013, in EID Journal: Predicting Hotspots for Influenza Virus Reassortment, we looked at a study that selected East-Central China a one of the top hotspots in the world for the creation of zoonotic influenza viruses – those that can jump from animals to man. And then, almost on cue, two weeks later we saw the first reports of a new avian flu virus that had jumped to humans in Shanghai; H7N9. In a matter of less than 60 days, more than 130 human cases were diagnosed. The following year - another 320+ cases were tallied, and over the summer we saw the following assessment appear in Eurosurveillance: Genetic Tuning Of Avian H7N9 During Interspecies Transmission. Overall, due to the genetic tuning procedure, the potential pandemic risk posed by the novel avian influenza A(H7N9) viruses is greater than that of any other known avian influenza viruses. In January of 2014 a major outbreak of a newly emerging H5N8 virus struck South Korean Poultry (see EID Journal: Describing 3 Distinct H5N8 Reassortants In Korea) and last week showed up in Germany. Suddenly, we’ve gone from having 1 worrisome bird flu virus (H5N1), to having at least 5 (H5N1, H7N9, H10N8, H5N8, H5N6). All are the product of reassortment – the swapping of gene segments between two flu viruses - to produce a new hybrid. Although categorized by their two surface proteins (HA & NA) Influenza A viruses have 8 gene segments (PB2, PB1, PA, HA, NP, NA, M1, M2, NS1, NS2). Shift, or reassortment, happens when two different influenza viruses co-infect the same host swap genetic material. New hybrid viruses may be the result of multiple reassortments, with gene contributions coming from several parental viruses. Interestingly, while their HA and NA genes may differ – almost all of these new viral interlopers carry the internal genes from the avian H9N2 virus (see The Lancet: H9N2’s Role In Evolution Of Novel Avian Influenzas). And while we are talking about 5 main subtypes (for now, anyway), we’ve seen evidence of dozens of variants or clades bubbling up within these subtypes - with new, updated versions emerging at a tremendous rate. 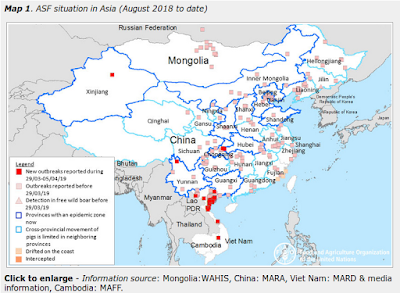 And new subtypes continue to emerge, as is evidenced by the announcement last month that an H5N3 virus was detected in a live bird market in Changsha, Hunan. The more subtypes in circulation, the more `interchangeable parts’ that are available for building new viruses. No one should be overly shocked if this list of newly emergent avian viruses continues to grow this winter. All of which brings us to a new 5-page FAO EMPRES report published today, excerpts which I’ve posted below. By all means, download the entire PDF, as it is chock full of good information and covers the genesis – and possible interaction with – other avian influenza viruses in the region (i.e. H7N9, H10N8, H5N8, etc.). The epidemiological and genetic analysis described above show that the virus is still more adapted to avian-type than human-type respiratory receptors. However, with winter season approaching in eastern Asia, the prevalence of the virus in poultry is expected to rise, increasing both chances for human exposure and opportunities for mutation or reassortment, especially considering the location of circulation of this virus: in endemic regions with H5N1, H9N2 and H7N9 for China. The latter could change the viruses’ transmissibility to humans. H5N6 therefore remains a public health threat, which requires close monitoring in the same way as for H5N1 HPAI and H7N9. The possibility exists that wild birds could become infected and spread these viruses to other countries or continents. Migratory birds, which have played a key role in the introduction of H5N1 to Europe and Africa [Kilpatrick et al, 2006] and of H5N8 to the Republic of Korea [Jeong et al, 2014], could spread the viruses to other countries or continents. Research is required to better understand the role migratory birds play in the epidemiology of these novel viruses and related risks. For those who may have missed it, coincidentally I wrote about concerns over the spread of H5N6, H7N9, H5N8 and other avian flu viruses this morning in Bird Flu Spread: The Flyway Or The Highway?